As a leading professional and vocational training provider in the industry, Global Edulink offers the Cisco Complete Networking Training course package (bundle) that includes CCNET 100 – 101 ICND1, CCNA 200 – 101 ICND2, Security 640 – 554 IINS, Voice 640 – 461 ICOMM, and Wireless 640 – 772, CCNP 300 - 101 RUTE, 300 – 315 SWITCH, and 300 – 135 TSHOOT and CCDA 640- 864 DESIGN exam preparation courses. Providing you start off at entry-level, there are no entry requirements to undertake this course. Cisco recommend approx. 2 years of relevant networking experience. Cisco Certified Network Associate (CCNA) or any Cisco Certified Internetwork Expert (CCIE) certification. 1 years of relevant networking experience. This online training course bundle is comprehensive and designed to cover the requirements of following official exams. This course has been designed for 180 guided learning hours. CISCO CCENT 100-101 - ICND1 - INTERCONNECTING CISCO NETWORKING DEVICES PART1. CISCO CCNA 200-101 - ICND2 - INTERCONNECTING CISCO NETWORKING DEVICES PART2. CISCO CCNA 640-554 - CCNA SECURITY - IMPLEMENTING CISCO IOS NETWORK SECURITY - IINS. CISCO CCNA 640-461 - VOICE - ICOMM V8.0 - CISCO VOICE AND UNIFIED COMM. ADMIN. CISCO CCNP 300-101 - ROUTE - IMPLEMENTING CISCO IP ROUTING. CISCO CCNP 300-115 - SWITCH - ROUTING AND SWITCHING. CISCO CCNP 300-135 - TSHOOT - TROUBLESHOOTING AND MAINTAINING CISCO IP NETWORKS. CISCO CCDA 640-864 - CISCO CERTIFIED DESIGN ASSOCIATE. SPECIAL NOTE:This is not included official Exam and you need to purchase exam separately. Please contact our Help Desk for further information. 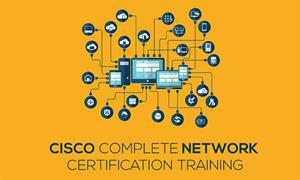 Fill out your details to find out more about Complete Cisco Networking Course Bundle.